In this Dec. 6, 2015, file photo, the New England Patriots, right, and the Philadelphia Eagle get set for the snap at the line of scrimmage during an NFL football game at Gillette Stadium in Foxborough, Mass. The two teams are set to meet in Super Bowl 52 on Sunday, Feb. 4, 2018, in Minneapolis. NBC has got you covered to watch the Super Bowl this weekend. The New England Patriots take on the Philadelphia Eagles at U.S. Stadium Bank in Minneapolis, Minnesota, on Sunday, Feb. 4. NBC will let users watch the game on desktop, tablets and connected devices (Roku, Apple TV, etc.) without needing to sign in. 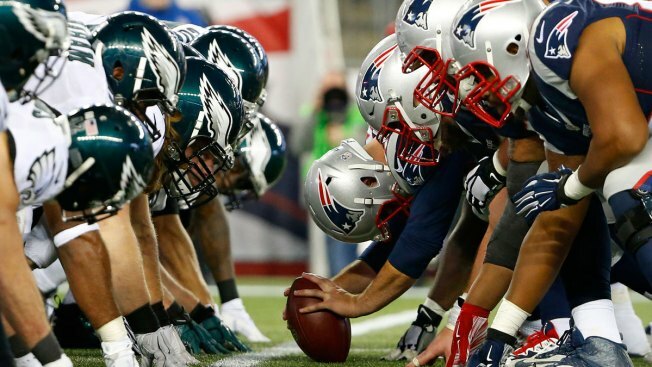 On TV: NBC begins Super Bowl Sunday coverage with the Road to the Super Bowl at 12 p.m. ET, followed by the Super Bowl Pre-Game at 1 p.m. ET. The game begins at 6 p.m. ET with kickoff at 6:30 p.m. ET. A new, special episode of "This Is Us" will follow the game. On Desktop or Tablet Devices: All of the same coverage that appears on TV is available on your desktop or tablet -- the Road to the Super Bowl, Super Bowl Pre-Game and kickoff, as well as "This Is Us." This can be viewed on your desktop or tablet on our sites live here. You do not need to sign in with your television provider information to watch these Super Bowl events. Apps on Connected Devices (Roku, Apple TV, etc. ): All coverage of Road to the Super Bowl, Super Bowl Pre Game and kickoff, as well as "This Is Us," can be viewed on the NBC Sports App. On Mobile Devices: The Pre-Game show and "This Is Us" can be watched on our app by clicking Watch Live TV Now (under the navigation on the top left of the app) or the Live TV icon on the top right of your screen, or just by clicking here. But the game itself must be viewed via the NFL Mobile App.